It is spring, I hear, but it’s hard to tell at this altitude. This high flat prairie is khaki tan with hardly a green shadow. The wind crosses the farm like a speed skater and if there are tiny leaves budding on the trees, they have been flogged and bruised. The temperature says spring but the only other sign comes from Edgar Rice Burro. He broke out of the pen four times in three days this week. He is very smart and his prehensile nose the works better than a thumb on a gate latch. One day he found her, standing at a trailer. She was statuesque and elegant. She sensed it too. It was a light note, an impossibly sweet melody, so fine and light that only the longest, the most sensitive ears could hear: Spring. ← Horse Agility and Calming Signals. Your sweet burro is immensely photogenic! Thank you, it’s true. It’s those long ears! Edgar Rice Burro! That name (and pic) made my day. 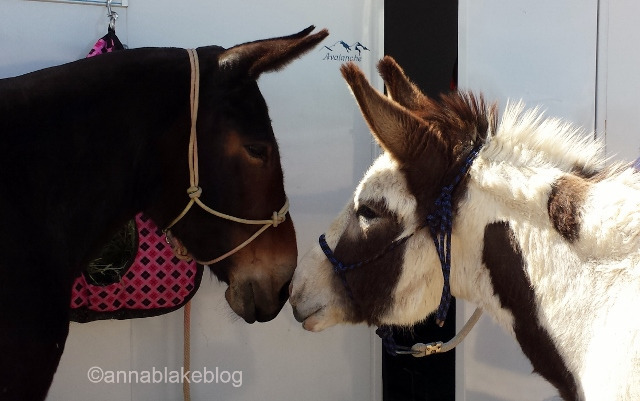 Tina, you are just really sweet on donkeys!